Ambrosia Maple woodturning blanks inventory and prices! Ambrosia Maple comes from regular Maple trees that have been infested by the Ambrosia Beetle. The small beetle bores a network of small tunnels. A fungus is responsible for the black and gray streaks that accompany each tunnel and adjacent wood. The streaks add a unique look to this hardwood without affecting its structural integrity. The beetle or its larva may still be in the woodturning blanks that you receive. The amount of ambrosia will vary from blank to blank. 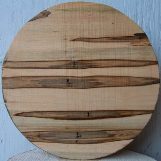 Many woodturning blanks contain spalting or mineral stain.